There were plenty of questions rather than praises being thrown around when talking about the PBA Draft class of 2017. The draft was described by many pundits as top heavy, with a lot of talent in the projected top picks, but beyond that, there was very little to be excited about. In fact, even the top picks were seen to have flaws and weaknesses which made them less enticing from the perspective of an analyst. Among the draftees, the players who received the most flak were former kings of their respective teams, Kiefer Ravena and Jeron Teng. The former UAAP Mythical Five members were seen as safe choices. Rather than being talked about as potential franchise changing pieces, the point of conversation regarding the two blue chippers were their flaws as they transitioned to the pro game. There were concerns regarding Kiefer’s ability to play without the ball after being so used to a Kiefer-centric system in College. On the other hand, Jeron’s jumper and ability to create for others were big questions. Two games in to their PBA careers, and it looks like both Kiefer and Jeron are determined to prove their doubters wrong. The most impressive rookie so far to the eyes of many has been The Phenom, who racked up PBA Player of the Week honors after two impressive performances to start off the PBA season. The base numbers support this claim as well, putting up impressive numbers across the board (19.5 PPG, 8.5 APG) while maintaining efficiency while putting up these numbers (56-36-80 shooting splits, 2.0 turnovers per game). 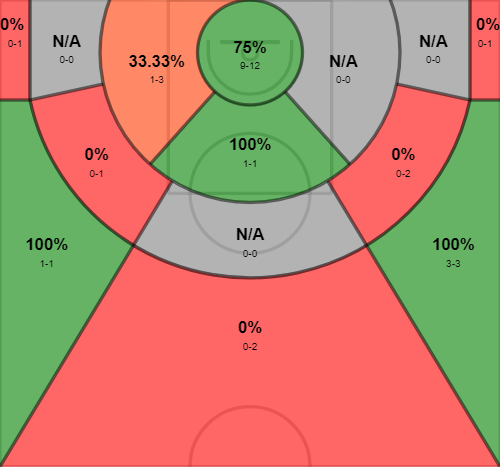 In terms of scoring, Kiefer’s scored most of his baskets around the rim off drives and cuts. His mid-range jumpers have been limited, and he’s been conservative with taking a lot of three-point shots. This is a testament to Coach Yeng Guiao’s system and Kiefer’s willingness to abide by this. Coach Yeng has never implemented systems that have centered around just one player no matter how talented he may be (Paul Lee, Willie Miller). Instead, he blends the strengths of these guards into the system that he runs, and Kiefer has done a splendid job so far at doing just that. 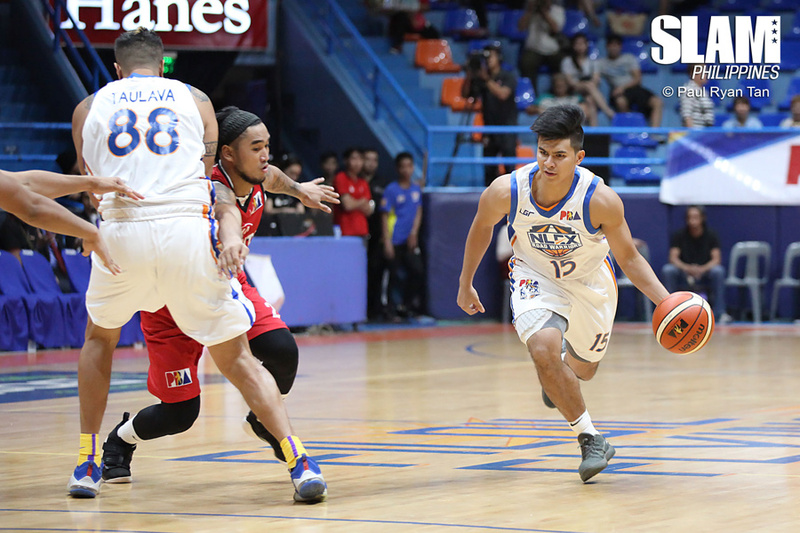 In his very first possession with the Road Warriors, Kiefer showcases just that. He gains possession and immediately attacks the rim off the Asi Taulava screen. This showcases aggression, something natural of any rookie. But what he does next is what separates him from the rest. Normally, newcomers are aching to score to get rid of their jitters. But Kiefer does what is best for the team instead. As his drive attracts multiple Kia defenders, he immediately dishes it off to Raul Soyud for the easy basket down low. With that very first possession, we were witness to two qualities that pundits have endlessly talked about Ravena – his basketball IQ and maturity. Those are the type of plays rookies don’t make. There’s normally a gigil to score, and Kiefer didn’t let that get in the way of him making the correct basketball play. Other than the playmaking, his work off the ball has been equally as impressive. He hasn’t been as high usage as he was in Ateneo (23.2 Usage Percentage in the PBA versus 31.5 Usage Percentage during his final year in the UAAP), but his production hasn’t fallen off by any means. The result has been better use of possessions, resulting in easier baskets for Kiefer. Less possessions and easier looks means great production across the board. In the GIF above, Kiefer isn’t even found holding the ball leading to his bucket. It actually came from JR Quinahan, who handed it off to Larry Fonacier who then dished it off to Kiefer for the spot up three-pointer. It’s the little things that matter in this play: There’s no tinge of the system being centered around Kiefer, and Kiefer himself accepts this. Instead of standing in the corner aimlessly, he keeps his eyes on the play and remains prepared for the pass even if there’s no assurance that he even gets it. Patience helps, and it leads to the rhythm three by Kiefer. The play above perfectly captures Kiefer’s value as an off ball cutter. Playing off the ball means that you move, and movement makes defenses think even harder regarding what you can do. You’re given options when you move. There’s the possibility of catching the ball and pulling up. Or maybe, you can cut to the basket and drive to the hole for the easy deuce. Or what about what Kiefer does – he cuts to the rim, attacks the basket, attracts the defense then calmly dishes it off to Rabeh Al-Hussaini down low. Great stuff. Aside from the base numbers, advanced statistics show that he’s been an elite player to start off his PBA career. Despite his relatively low usage percentage (doesn’t even crack the top 25), he still manages to rank third in terms of Assist Percentage among players who have played more than 15 minutes per game, just behind Baser Amer and Jayson Castro. Even his defense has been top notch, ranking fifth in terms of Steal Percentage and third in terms of steals per game. As a result, the Road Warriors have outscored opposing teams by 32.9 points per 100 possessions every time Kiefer steps on the floor. No doubt about it, Kiefer has been elite. While Kiefer has been receiving most of the press, Jeron has had quietly put together a solid pair of games to start off his PBA career. 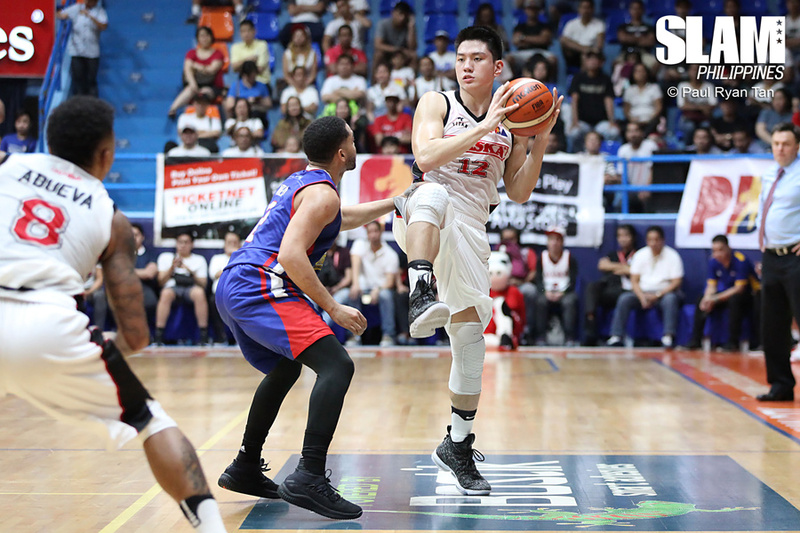 While his first game wasn’t celebrated as much as Kiefer’s, he bounced back with a stellar second game to end up with averages of 22 points per game, six rebounds per game and two steals per game. He’s been a bright spot for the Alaska Aces, who find themselves winless after two games so far. 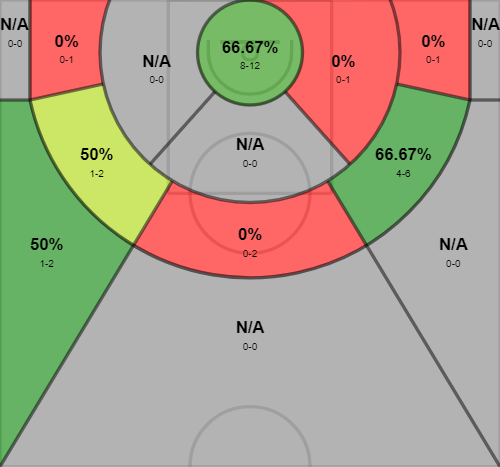 Jeron’s shot chart isn’t exactly what you would expect from how he played in college. He’s been getting good percentages from the rim, which shouldn’t surprise fans at all considering his reputation as a strong driver to the hole. What has been surprising are his numbers from the perimeter, where he’s put up solid numbers from the mid-range area, and has managed to take shots as well from as far as the three-point line. Not bad for someone with supposedly “no jumper”. In fact, it’s been the complete opposite with regards to his performance from the outside. Jeron has used his gravity of driving inside to his advantage, with most defenses sagging off every time he has the ball. In the possession above, he uses the Sonny Thoss pick to drive towards the left, doesn’t hesitate and immediately pulls up for the mid-range shot. He’s been money from the right elbow area, making more than 60 percent of his baskets from there so far. One of the other weaknesses that people saw from Jeron was his inability to play off the ball. This is why it was hard to see Jeron playing the shooting guard position beside someone like Calvin Abueva in Alaska. Playing him as an initiator in the small forward position made more sense so the Aces had more leeway for spacing. However, that hasn’t been the case as he’s played initiator for most of his first two games. His usage percentages are pretty close from the numbers he put up in the UAAP (27.0 in the PBA now versus 29.6 during his final year in the UAAP), but there have been flashes of an off-ball game either way. In the GIF above, Jeron uses the pin down to curl towards the right elbow, then pulls up with no hesitation for the easy jumper. It’s flashes like this which should get Alaska fans excited at the thought of Jeron embracing the two guard position. There are still issues regarding his mechanics and the speed of his release, but to see the willingness and skill to play off the ball from Jeron in situations like these is something to be happy with. During his time in La Salle, Jeron’s biggest weakness was arguably his three-point shooting. He averaged just 25 percent from three-point range in his entire stay, and did not show the confidence to play off the ball in order to attempt easier looks from that area. He focused on using his strength and athleticism to get to the rim, something he was successful at in the UAAP. Finally though, it looks like Jeron is starting to embrace the concept of three-point shooting. In the GIF above, he actually flashes to the left wing, looks ready to receive the ball, and immediately pulls-up when he finally gets it. Let’s make it simple: Once Jeron masters shooting the three-ball whether it be off pull-ups or better yet off the catch, the PBA will be in a world of trouble. Their PBA careers just started, so for sure, defenses will eventually adjust to the strong performances of both Kiefer and Jeron. For Kiefer, defenses will likely try to sag off him a little and bait him into taking those ill-advised three-point pull-ups he loved to take during his last two years with the Blue Eagles. For the case of Jeron, defenses will adjust to his mid-range shot and force him to attack left since that is his weak side after all. Their scouting reports will eventually be clearer, and so will the defenses which opposing teams will throw at them. Nonetheless, it’s refreshing to see two highly-scrutinized players shine in this level of basketball. We were so ready to crown them as the future of Philippine Basketball as early as High School, and they’re starting to showcase just that today. Kiefer Ravena and Jeron Teng are the Young Kings of the PBA, ready to face the giants that await them.